Looking for a cookbook that will help you combine the convenience of a slow cooker with your ketogenic lifestyle? Or do you want to get a book with a wide range of best slow cooker recipes, which are easy to prepare and at the same time surprisingly delicious? This Keto Slow Cooker Cookbook is an incredible resource for people who want to stick to a healthy slow cooker diet and enjoy a wide variety of dishes. A ketogenic diet is one of the preferred weight loss diets, and a slow cooker makes keto-food convenient. The ketogenic diet can help you lose weight and improve overall health. Scientific studies show that a ketogenic diet can reduce the risk of heart disease and diabetes. Besides, in The Ketogenic Diet Slow Cooker Cookbook you will know all the information you need on your multicooker, including how to use it and get the most out of it. Often you will find cookbooks that mention a slow cooker but use other kitchen utensils. On the contrary, each of these recipes, described in the cookbook, applies a slow cooker and uses only ketogenic diet products. 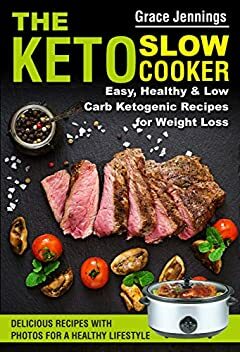 In this low carb slow cooker cookbook discusses how in the state of ketosis, fat is converted into ketone bodies for use as energy instead of glucose. â€¢ These recipes from the available products. Each recipe contains information about the necessary products, time and step-by-step instructions for cooking, the caloric content of the finished dish and color photo. This keto slow cooker recipe book will show you how easy it is to lead a normal life, combining the ketogenic diet with slow cooking. Keeping foods simple and tasty, these easy slow cooker recipes are sure to become the new favorite of the family. Owning this cookbook, you can spend more time with your family and at the same time enjoy tasty, healthy food! Please pay attention! Two paperback formats are available: Full color version and Black and white version.